The problem with lies is that once you start dishing it out, you would never stop, and that is because as the wise ones are getting closer to discover your lies, you would need to fabricate more lies to cover up your tracks. In the process, you would be dragging yourself into deeper waters, even as Freudian Slips take their toll. This scenario above has become the case at the Nigeria’s seat of power, and with Jubril Aminu of Sudan, the impostor masquerading as Nigerian long-dead president, Muhammadu Buhari. He was reported to have gone to far-away Krakow in Poland to defend himself on an allegation made at home. But what he actually did was expose the deceit inherent within the Nigerian ruling cabal, the Fulani oligarchy. 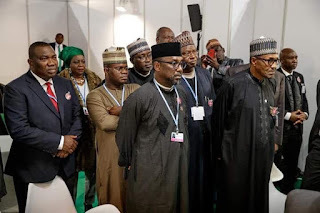 In Poland, at the United Nations’ Conference on Climate Change, Jubril claimed he was the real Buhari by attempting to be crafty by half. He used the word “Clone” to dodge the real issues upon which he was accused, which is impersonating the real Muhammadu Buhari who was rigged into power in 2015 by the duo of former US President, Barrack Obama and former UK Prime Minister, David Cameron. By doing that, he refused to touch any of the things by which he was accused – dates, timing, movements, and even specific body features. If he thought he was deceiving the world, he was mistaken. The world already knew that Indigenous People of Biafra (IPOB) which accused him had given dates and other evidence to prove that he was a body double impersonating late Buhari. The Biafrans had said, among other things that for Jubril to clear himself as Muhammadu Buhari, that he should hold a live press conference where people will watch him speak extemporaneously (especially with foreign independent journalists in attendance). Another thing he was challenged to do, to prove that he was indeed Buhari, was to speak Fulfude, the Fulani local language, which Buhari was known to speak very well. He was also told to remove his cap to let the world know whether he was the same bald Buhari they used to know. Buhari was equally challenged to prove to the world why he would suddenly become shorter than Bukola Saraki. The Senate President has turned out to be taller than him. But no! He did none of those. Instead, his fake response was: “I can assure you all that this is the real me. Later this month I will celebrate my 76th birthday. And I'll still go strong!" That was what Jubril Aminu, the lowly rated stage actor from Sudan who is living a lie posing as late Buhari, was reported to have said. Too bad, he dug himself into deeper waters. This showed that Jubril was neither smart, a sharp thinker nor with a good memory. Now, part of the challenge to Jubril (fake Buhari), was that he should hold a press conference (with foreign journalists in attendance) where all the people will be able to evaluate him, but what his handlers did was to pick some hungry Nigerians, bribe them and fly them to Poland to clap whenever Jubril spoke. In spite of everything, Biafrans are still adamant that Jubril is now the person parading himself as the real Buhari and they insist that the Nigerian government must address the issue properly. The accusation has been (and remained) that a Buhari look-alike was contracted from Sudan by the Nigerian ruling cabal, taken to the United Kingdom by the same Fulani cabal; who carried out an extensive reformation on him(Jubril) to clear the rough edges; and then ever since released him to act as Buhari’s body-double – an impostor, sitting in Aso rock presidential villa and deceiving Nigerians. That belief by the Biafrans and many other individuals in the world has not changed. In the final analyses, has Jubril held any press conference in Nigeria? Has he removed his cap? Has he spoken Fulfude? Has he explained why he suddenly became shorter than Saraki? All these questions are still in the negative. The world is watching and waiting. Biafrans are watching and waiting. And IPOB has promised to come up with more shreds of evidence; and this time, scientific pieces of evidence to finally sink Jubril and Nigeria. We are waiting!